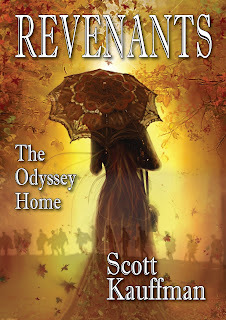 A sneak peak of our interview with Scott Kauffman, author of Revenants - The Odyssey Home You can find the full interview here. Lily: Let’s turn back the clock. When and why did you begin writing? Scott: I knew I wanted to be a writer when I read Scott Fitzgerald’s Winter Dreams in my first fiction class in college. Fitzgerald’s prose is so seductive to young men in their early twenties. Trouble is I was one of those banal twenty-year olds who really didn’t have all that much to write about. It wasn’t until I defended my first murder case that I felt I had something worth saying, and I wrote my first novel, In Deepest Consequences, which I think remains available as an e-book. Still it took me fifteen years to figure out how to tell the story. I’m not the fastest plotter either. Lily: Sometimes the best things in life take time. Like scotch. Are you working on anything new? Scott: The Song of Deborah: Before a grief-stricken bounty hunter risks the wrath of the syndicate hiring him to track down their fifteen-year old runaway, he must come to grips with his culpability in the suicide of his teenage daughter. Will finish up revisions this weekend and send out for editing.